China is considering giving more green cards to foreigners who want to stay in the country permanently, according to a Ministry of Public Security official. China will loosen the terms for Foreigner's Permanent Residence Card applications, so-called green cards, Qu Yunhai, vice director of the Bureau of Exit and Entry Administration of the Ministry of Public Security, said in Washington on Sunday. He said a large number of foreigners and Chinese with foreign nationality have offered suggestions concerning the green card system, and hoped to loosen application restrictions. "Now the Ministry of Public Security and the Ministry of Foreign Affairs are working together to draw up management measures for the system, which is expected to be released soon and will make a large impact on the administration of green card applications," said Qu. China launched the green card system in August of 2004, aiming to attract more international talents to invest in China and promote China's science, technology and cultural industries. It also fulfilled the urgent requirement for foreigners who want to permanently reside in China. 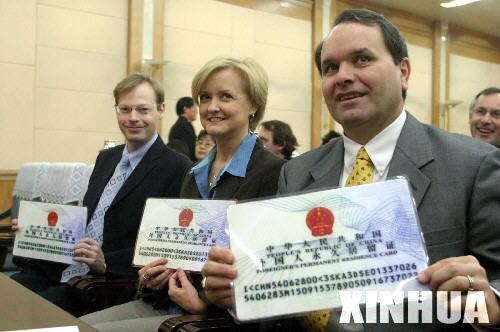 By the end of 2011, more than 4, 700 foreigners had obtained Chinese green cards, and have no restrictions in staying in China, and do not require visas when entering the country. China passed a new regulation on immigration in June of this year, which formulated principal measures for foreigners to apply for permanent residence in China. The new law streamlined the green card application process, making it easier for foreigners to live in China permanently.